October 27, 2011 - The Baltimore Police Department has ordered four Eurocopter EC120 helicopters to replace its current fleet. The department is one of the leading law enforcement operators of the EC120 in the world. The new helicopters will be part of a fleet renewal program and are scheduled to start delivering in summer 2012. ?The Baltimore Police Department?s commitment to the EC120 showcases the appeal of the platform in the airborne law enforcement community,? said Treg Manning, American Eurocopter Vice President of Sales. ?The department?s current fleet of 120?s have provided crucial support for its airborne law enforcement missions and have shown the durability of this airframe.? ?The reasons we chose the EC120 to upgrade our fleet are the same reasons we chose the EC120s in the first place,? according to Lieutenant Don Bauer, Aviation Commander for the Baltimore Police Department. ?It is always reliable. It?s fuel efficient and quiet. Out of all the aircraft we evaluated, nothing beats the EC120 for our department and our missions.? 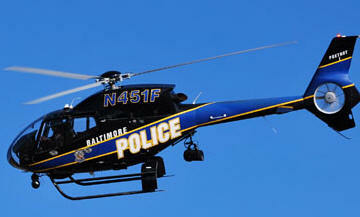 The EC120 is a workhorse for the Baltimore Police Department. It utilizes the EC120s for airborne law enforcement missions that include patrol and support as well as Homeland Security missions. Its current fleet of EC120s were purchased in 2000 and in July 2010, the department had the first EC120 in the world to reach 10,000 flight hours. The Baltimore PD fleet now has more than 35,000 flight hours. In addition to the aircraft?s performance and reliability, Bauer explains that the service and support provided by American Eurocopter was another selling point. ?We have almost a 12-year relationship with American Eurocopter. Their commitment to supporting our aircraft and our department has helped us keep our aircraft in the air and performing our missions. It made our decision even easier.? The new EC120?s will be completed at American Eurocopter?s Grand Prairie, TX facility and will include advanced avionics and mission equipment, including thermal imager, searchlight, moving map, and video downlink systems. Baltimore PD?s EC120?s will have both front seat and rear seat consoles for Tactical Flight Officers, which are being custom-designed by AE. The EC120 delivers excellent maneuverability, a wide unobstructed cabin, excellent visibility and, with the new generation Fenestron tail rotor, it provides one of the most environmentally conscious sound signatures in its class. The aircraft is powered by a fuel-efficient Turbomeca ARRIUS 2F engine and equipped with advanced technologies, like the cockpit?s Vehicle and Engine Multifunction Display (VEMD) that decrease pilot workload.